Victims of Japan's wartime forced labor have filed for an asset seizure against Nippon Steel & Sumitomo Metal Corp. as the Japanese firm has not carried out the top court's order to compensate them. 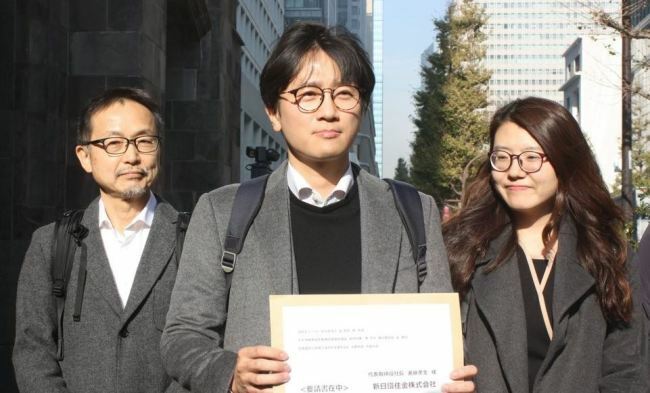 A legal counsel representing the four victims and their descendants has recently asked a local court to seize assets in South Korea held by the Japanese firm. In late October, the Supreme Court handed down a landmark ruling that ordered the Japanese company to pay each plaintiff 100 million won ($89,800) in compensation. Lee Chun-sik, 95, is the only surviving victim out of the four. The subject of the property seizure that the victims asked for is known to be shares of PNR, a joint company between NSSM and South Korea's top steelmaker POSCO. The Japanese steelmaker is estimated to hold around 2.34 million shares of PNR valued at some 11 billion won. It is uncertain whether the asset seizure could be executed. The legal counsel earlier visited the Japanese steelmaker's headquarters in Tokyo to deliver a document calling on it to state details about how to carry out the court's order. But NSSM has been mum, with a deadline for the Japanese firm to reply having expired on Dec. 24. The already chilly relations between South Korea and Japan were dealt a heavy blow with the Seoul court's ruling, which acknowledged individual rights to compensation for damage caused during Japan's 1910-45 colonial rule. In November, the top court gave similar rulings against Mitsubishi Heavy Industries Ltd. to pay compensation to ten former forced laborers.